Sometimes I miss pasta. And sometimes, on the rare occasion, I eat pasta. For me, a little here and there is okay, but if I overdo it, it reminds me why I quit eating pasta and refined foods. I get brain fog, lethargic, and lose motivation. My digestion slows, I’m bloated and feel gross for days. The longer I go without gluten and grains, the more clear-headed and energetic I become. Still, sometimes I miss pasta. Spaghetti squash is great. Zoodles are my hero. But cabbage “pasta”? I am head over heels in love with cabbage “pasta”. It is SO easy, fast, delicious, and only requires a handful of ingredients. Cabbage is a cruciferous vegetable, great for supporting your body’s ability to detox. It contains the sulfurous compound, sinigrin . Promising research shows sinigrin has unique cancer-preventative properties. Cabbage is also an excellent source of vitamin C and a very low-carb-friendly food. It’s also full of antioxidant, free-radical-zapping power! So eat more cabbage and make this recipe. 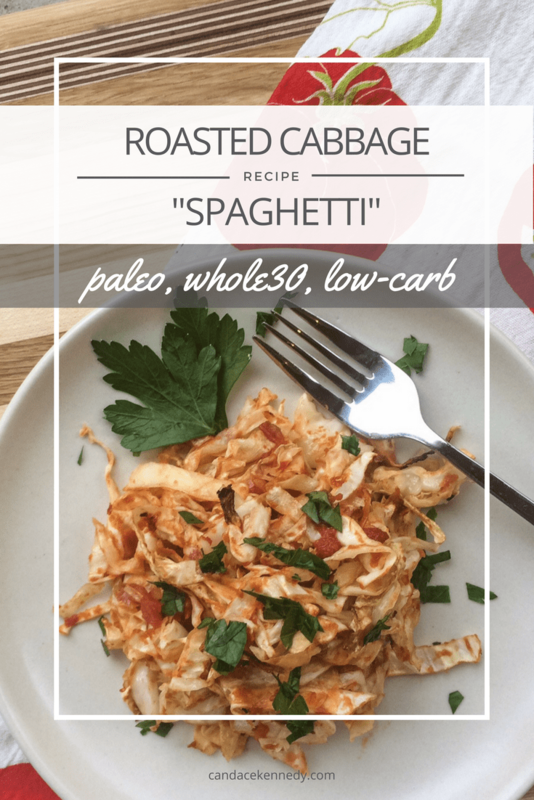 This Roasted Cabbage “Spaghetti” is paleo, whole30, and low-carb friendly. Thinly slice your cabbage. I slice it about the width of a fettucini noodle. 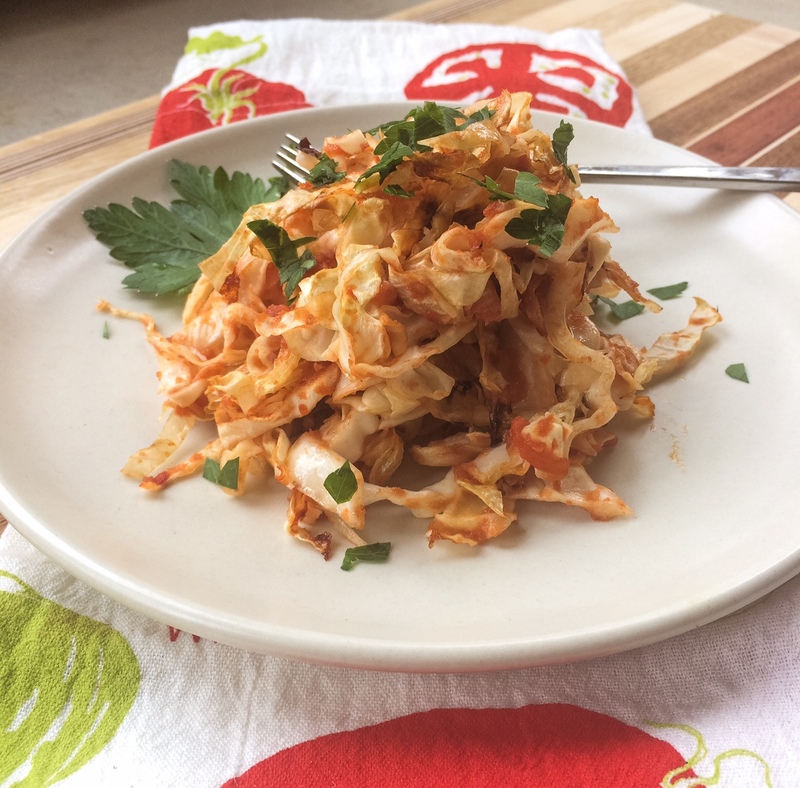 Toss the cabbage with olive oil, sea salt, garlic powder and tomatoes. Spread the cabbage out in a thin layer on 1-2 baking sheets (I like to line my baking sheets with parchment paper). Top with parsley. You can also add any protein you choose. 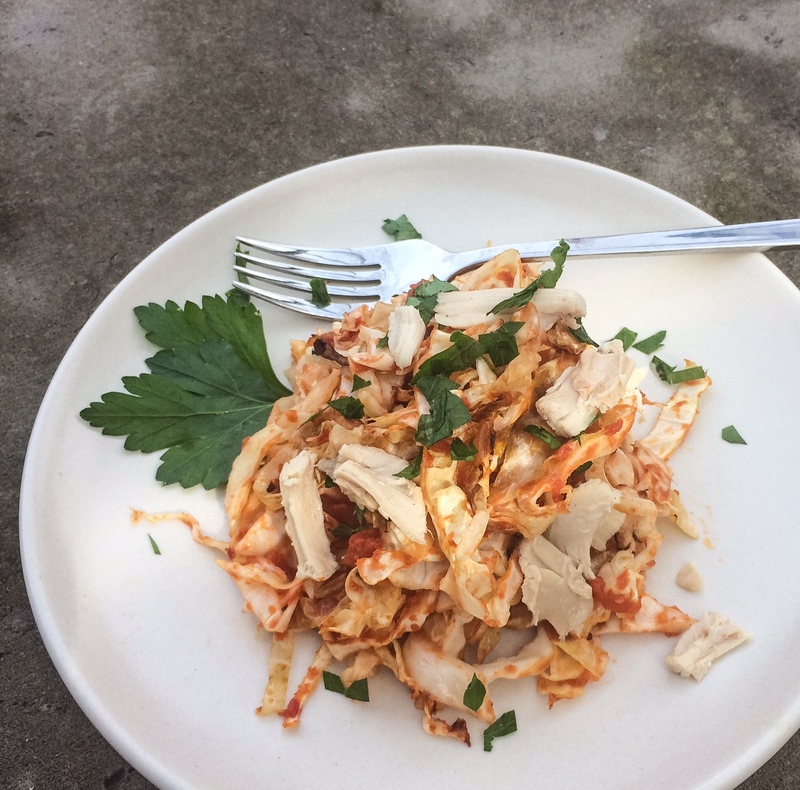 Below is a picture of the “spaghetti” with chicken. It’s also great with a meat sauce. Equally delicious: I often skip the diced tomatoes when I make this. The cabbage is just as good! I have a hard time making it last from the time it comes out of the oven to the time it should be served. AIP: Skip the tomatoes. See note above. You won’t miss them. Trust me. You can always add an AIP-friendly no-matoe sauce, also. Keto: Skip the tomatoes (a theme here!) and toss the cabbage with grass-fed butter. You can also add parmesan cheese, if you aren’t sensitive to dairy. Low-FODMAP: Don’t use savoy cabbage (it’s the highest FODMAP cabbage). Green and Napa cabbage are great choices. So is red, if you want an extra-pretty dish. Instead of garlic powder and olive oil, use a garlic-infused olive oil. Are you making this recipe? What variations did you try? Let me know in the comments below!